Want to bring water balloon warfare to the next level? 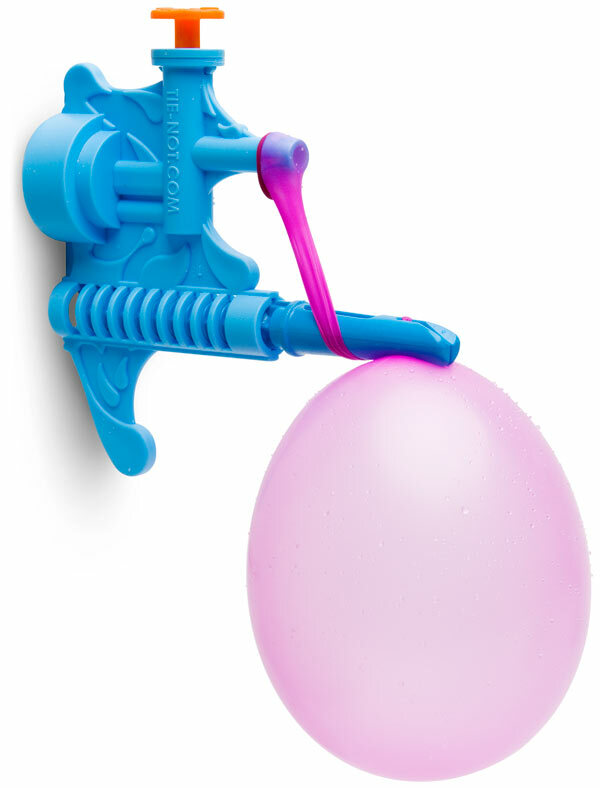 This ingenious tying tool makes it easy to fill and tie your water balloon arsenal quickly and efficiently. Destroy your enemy while they are still struggling to fill balloons the old fashioned way. The Tie-Not is hands down the fastest and easiest way to make a water balloon. Just attach the tool to any garden hose and anyone can tie the perfect balloon in a matter of seconds, even kids. Simply stretch a balloon around the nozzle, fill it up by pressing the plunger on top, wrap it around the Tie-Not tool, slip the end of the balloon through the notch, and pull off a perfectly tied balloon every time. A seasoned pro can make a water balloon in about six seconds with this little device. This time saving tool can be the difference between victory and defeat in the high stakes world of water balloon warfare. The Tie-Not also comes with an optional Portable Battle Pump, which makes filling a balloon much easier than using a faucet. The Battle Pump comes equipped with 250 balloons so you’ll be ready for action.